Personal and school seals reflect your personality and that of your school. With our custom Japanese seal design we work with you to not only create the right translation but to also capture the look and feel that you would like. Generally, there is a lot more leeway with personal seals. These can be more individualized, especially if it is for your own use. Instructor’s seals may want to follow the school tradition which may require a certain size, style (square, oblong, round), and translation method (katakana or phonetic translations to kanji). Think of the personal seal as your signature and how you would like your signature to look. School seals are almost always strictly formal. This means square and using tensho (seal script) fonts. They are also usually larger than an inch. The final design may be ordered as a high-resolution digital image or on flat, white, acid-free paper. From either a seal may be carved or the design may be used to create a rubber stamp as is commonly available. Work directly with Master Japanese Calligrapher Eri Takase to create a custom master certificate for your school or association. We work with you on all aspects of the design including translation, layout, and font. You may order the final certificate as a digital image from which you can print your own certificates, or you may order the final certificate that we would mail to you. We also include a separate sheet that has all of the kyu and dan ranks. The fee for the certificate is one time and you would then be able to create as many certificates as you like using this master certificate. We only provide the Japanese calligraphy part of the certificate. Any English text you would have to do yourself or have done. Also, seal designs would need to be ordered separately. Our Japanese Scrolls are really special and we are very proud of them. We have been working with our scroll maker in Nara, Japan for more than a decade and are the only one in the United States using these special scrolls. Creating scrolls is significantly more involved than our other offerings so we wrote an entire page dedicated just to the custom design and creation process that we use for scrolls. These scrolls are both a treat to work with and a treat to see. The scrolls have silk borders and the materials are layered so that when displayed the scroll will hang straight and not warp over time. This is important. And the paper takes the ink just right so subtle brush strokes come out just as expected. I love these scrolls. If you are interested in ordering a custom scroll, or in simply learning more about our scrolls and the process we use, please do visit our on Custom Japanese Scrolls page. If you would like to see more scroll options, including our non-custom scroll catalog please click the button below. Custom Japanese Art is always a nice touch to your school or home dojo. Whether your school name, style or motto we work with you to get just the look you want. Takase Studios has been selected by several belt makers to provide full names in katakana so we have become very efficient and are able to offer this amazing price. Out Names in Japanese Catalog is one of the best on the Internet as we include the pronunciation of the name along with the translation. This is important for international pronunciations. For example, the name “Jan” can be pronounced “jan” and “yahn”. Japanese is rendered by the pronunciation so the first would be ジャン and the latter ヤン. Very different. All we need from you is your full name and the pronunciation. There are practical limits. The name “Pedro Pablo Ignacio Juan Francesco García y Gabaldon” would result in teeny characters and not be suitable for a belt. Smile. Typically the first and last name work best. Aiki in Japanese is 合気 which is read aiki. The Japanese word aiki is composed of the kanji 合 (read ai) meaning "join; meet" and 氣 (read ki) meaning "spirit". Aiki is a martial arts principle that focuses on the combining energy rather than the clashing of energy. One example is the principle of using an opponent's strength against them. Certain Victory in Japanese is 必勝 which is read hisshou. The Japanese word hisshou is composed of the kanji 必 (read hitsu) meaning "certain; must" and 勝 (read shou) meaning "win; Victory". Certain Victory (hisshou) is also used to describe someone that is determined to win or determined to succeed. Dojo in Japanese is 道場 which is read doujou. The Japanese word doujou meaning "Dojo" is composed of the kanji 道 (read dou) meaning "road, way, journey, teachings" and 場 (read jou) meaning "location, place". Fighting Spirit in Japanese is 闘魂 which is read toukon. The Japanese word toukon meaning "Fighting Spirit" is composed of the kanji 闘 (read tou) meaning "fight" and 魂 (read kon) meaning "spirit; soul". Fighting Spirit (toukon) is used in martial arts to describe a person that is a fighter by nature. It is also used to describe one's will to fight the battles of life such as the will to fight cancer or to take on life's myriad challenges. Fighting Will in Japanese is 闘志 which is read toushi. The Japanese word toushi meaning "Fighting Will" is composed of the kanji 闘 (read tou) meaning "fight" and 士 (read shi) meaning "will; resolve". Inner Strength in Japanese is 気力 which is read kiryoku. This motivational work of art is the perfect gift for a beautiful reminder of "Inner Strength" and to be strong now. The Japanese word kiryoku means "Inner Strength; Willpower" and is composed of the kanji 気力 (read ki) meaning "spirit; inner energy" and 力 (read ryoku) meaning "strength; power." Notice that there are two ways to write the kanji ki: 気 is the newer form of 氣 however both forms are commonly seen. Jujitsu in Japanese is 柔術 which is read juujutsu. The Japanese word juujutsu is written in English as both "Jujitsu" and "Jujutsu" and is composed of the kanji 柔 (read juu) meaning "supple; gentle; soft" and 術 (read jutsu) meaning "technique; skill". Karate - Empty Hand in Japanese is 空手 which is read karate. There are two common ways to write "karate". This version literally translates to "Empty Hand" and is composed of the kanji 空 (read kara) meaning "empty" and 手 (read te) meaning "hand". 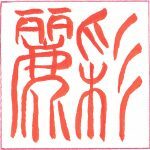 "karate" can also be written 唐手 Karate - China Hand (karate) meaning "China Hand". Kempo in Japanese is 拳法 which is read kenpou. Kendo in Japanese is 剣道 which is read kendou. Kyudo in Japanese is 弓道 which is read kyuudou. The Japanese word kyuudou often written in English as "Kyudo" is "Japanese Archery" and is composed of the kanji 弓 (read kyuu) meaning "bow" (as in "bow and arrow") and 道 (read dou) meaning "the way; teachings". Martial Arts in Japanese is 武道 which is read budou. The Japanese word budou means "Martial Arts, Bushido, Military Arts" and is composed of the kanji 武 (read bu) meaning "martial, military, warrior, arms" and 道 (read dou) meaning "the way; teachings". The Way, or dou, refers to a way of life and so Budo may be thought of as the martial way of life. Martial Arts (budou) is commonly written in English as "Budo". It is also used as a synonym for Bushido (bushidou). Peaceful Warrior in Japanese is 和戦士 which is read wasenshi. Real Sword in Japanese is 真剣 which is read shinken. The Japanese word shinken means Real Sword and is composed of the kanji 真 (read shin) meaning "True" and 剣 (read ken) meaning "Sword". shinken is commonly used in Japanese to mean "serious" or "earnest" alluding to the idea that one is using a "real sword" rather than a practice or unsharpened weapon. Remaining Mind in Japanese is 残心 which is read zanshin. zanshin is a beautiful work and a perfect gift for the Martial Artist and, in particular, for the Japanese Archery practitioner. The Japanese word zanshin is a Martial Arts term (particularly Kyudo (Japanese Archery) ) commonly translated as "remaining mind; follow-through" and refers to a relaxed but alert state. It is composed of the kanji 残 (read zan) meaning "remaining" and 心 (read shin) "heart; mind; spirit". Ronin in Japanese is 浪人 which is read rounin. The Japanese word rounin, written in English as Ronin, means "Masterless Samurai" and is composed of the kanji 浪 (read rou) meaning "wave; wandering" and 浪 (read nin) meaning "person" . The kanji literally means "wandering (or wave) person". Ronin were masterless 侍 Samurai (samurai) though today the English word Ronin implies one who is independent or one that "goes their own way" in the sense of a 一匹狼 Lone Wolf (ippikiookami). Protect in Japanese is 保護 which is read hogo. This beautiful calligraphy of "Protect" in Japanese is the perfect gift to acknowledge the special protector in your life. The Japanese word hogo meaning "Protect" also translates as "shelter; safegaurd; care for" and is composed of the kanji 保 (read ho) meaning "protect" and 護 (read go) meaning "safegaurd; protect. Samurai in Japanese is 侍 which is read samurai. The Japanese word samurai is a single kanji word 侍 (read samurai) that means "to serve". The idea of the warrior whose primary focus is to serve is reminiscent of the American police motto 保護と奉仕 To Serve and Protect (hogo to houshi). Sanchin in Japanese is 三戦 which is read sanchin. The Japanese word sanchin is the name of a fundamental karate Form (kata). sanchin means "three battles" and is composed of the kanji 三 (read san) meaning "three" and 戦 (read chin) (more commonly read "sen") meaning "war; battle; match". Sparring in Japanese is 組手 which is read kumite. The Japanese word kumite meaning "Sparring" is composed of the kanji 組 (read kumi) meaning "unite" and 手 (read te) meaning "hands". kumite is Martial Arts training with an opponent. Sword in Japanese is 剣 which is read ken. Warrior Spirit in Japanese is 戦士魂 which is read senshidamashii. The Japanese senshidamashii combines 戦士 Warrior (senshi) and 魂 Soul (tamashii). senshi means "Warrior" and does not necessarily imply the 侍 Samurai (samurai) tradition. Win in Japanese is 勝つ which is read katsu. This motivational art is the perfect gift for the driven to win person in your life. The elegant lines match the framing style making the art well suited to modern office decor. Are you looking for Martial Arts Calligraphy Designs to use in your school newsletter, marketing material or to jazz up your website? Maybe you are designing a T-Shirt or Poster for an upcoming event? Then please consider using our stock Martial Arts Calligraphy designs. Our catalog has thousands of designs to choose from including many hundreds focusing specifically on the theme of the Martial Arts. These are all hand-lettered designs created by Master Japanese Calligrapher Eri Takase and carefully scanned and documented. Designs are delivered digitally right when you order so there is no waiting – you can get the perfect design in just seconds. All designs come in four formats. For personal use designs, we offer an Adobe PDF Format which will print out exactly as designed by Master Takase. These designs cannot be edited but may be used in a single application and are perfect for tattoo designs and craft projects. For commercial use, we offer three JPG resolutions: 72 dpi, 300 dpi, and 600 dpi. The lower resolutions are suitable for images as part of a website, for example. The higher resolutions are suitable for all print applications. Personal use designs start at $11.95 and professional use designs at $31.95. Ordering is safe and easy. We also offer completely custom commercial use designs where you work directly with Eri Takase to create a design to your specifications. For these custom designs we have two options: the first is for Limited Distribution and is Non-exclusive and starts at $135, the second is Unlimited Distribution and is Exclusive and starts at $350. These are completely custom designs giving you input at every step of the design process. Finally, artwork can be created for any of these designs. These would be hand-lettered by Master Takase with her seal and signature – These are truly special gifts of art and are perfect for the home or dojo. These may be ordered at Custom Unframed Artwork on Japanese Paper or a Custom Japanese Scroll. Are you not finding what you want in the catalog? We would love to hear your feedback on ideas you would like us to include in the catalog. Please feel free to contact us with your suggestions. You are also welcome to contact us with any questions about any of our Martial Arts Japanese Designs. So whether you are a graphic artist looking for a specific design to illustrate a book or an individual looking for an authentic and meaningful tattoo, we offer thousands of Martial Arts Kanji Designs. Below we show just a fraction of the designs we have available and hopefully this will inspire you to see our full on-line catalog of designs at StockKanji – Martial Arts Calligraphy Designs.